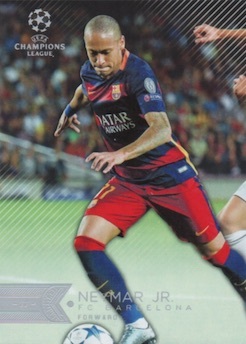 Covering the annual inter-league competition among European soccer clubs, 2015-16 Topps UEFA Champions League Showcase Soccer includes some of the best players in the world. Each master box yields two autograph cards. With 200 cards, the base set offers a detailed look at the top teams across the continent. Several parallels add to that total, including Green (#'d), Gold (#'d), Red (#/25), Black (#/5), Champions (1/1) and Printing Plates (1/1). 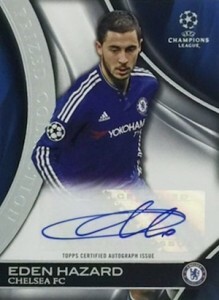 Featuring a sticker autograph on the main design, Base Autographs include some key Champions League names. Also like the base set, limited signed parallels involve Green (#'d), Gold (#'d), Red (#/25), Black (#/5), Champions (1/1) and Printing Plates (1/1). Presenting other signed options, Prized Collection Autographs fixate on the biggest stars and Champions Pairings Autographs feature two players that have something in common. Both autographed inserts also have Black (#/5) and Champions (1/1) parallels. 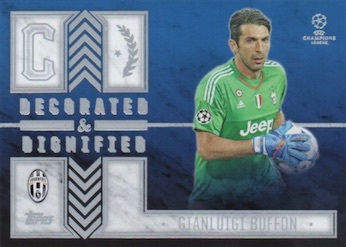 Several inserts round out 2015-16 Topps UEFA Champions League Showcase Soccer. Decorated and Dignified takes a look at team captains and Best of the Best (#'d) only features the truly elite at a rate of two per case. The insert sets also include Red (#/25), Black (#/5) and Champions (1/1) parallels. Honoring the title holders, Champions Pedigree is an insert that celebrates the players who won their club league titles. There are also signed versions. Solely dedicated to FC Barcelona, Road to Victory covers the club's winning run during the 2014-15 UEFA Champions League. Good: Two autographs per box, wide mix of international soccer talent, some big names in the autograph checklist, nice base design. Bad: Plenty of low-value autographs to pull, one-note feel to product, inserts offer little. The Bottom Line: By the very basis of the tournament, there are some big teams and some less likely participants. This ultimately results in a diverse group of players, which is good for some, but the low-tier teams are hardly a beacon for talent or value. All things considered, the price is solid and the potential value is there, but, like most products, most would be better off just buying the singles they are after. 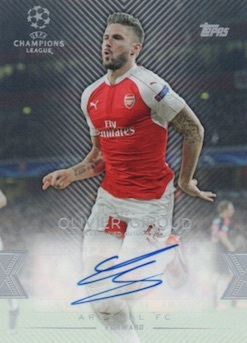 I enjoyed the base design in 2015-16 Topps UEFA Champions League Showcase. The subtle diagonal lines gave a little personality but still allowed the crisp images to be the focus. It definitely came across as casual elegance and was nice to find in a mid-level release. My only complaint is the the silver text used for the player name makes it rather tough to read who it is since the lighter part of the images (normally the field) is the background for this portion. While the parallels feature very minimal additions, I still found them easy to spot, which is a good thing in my book. They were also each numbered and not overly common, which is also appealing. Beyond that, however, there is not much else to the set. As far as the basic inserts, none of them really wowed me. 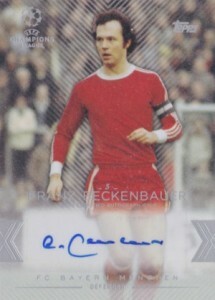 Autographs simply add stickers to the base or insert designs. Although I did not pull one of the Best of the Best inserts, I appreciate that an effort was made to offer a little rarity within the basic card options. Just like any major tournament, there are big teams and small teams. This makes for a great option for soccer collectors who have not had nearly the same chances as other sports to collect from their favorite clubs. Having said that, it also means there are plenty of obscure subjects and it does give the product license to roll with some of the lesser squads in the autograph checklist. That’s not to say there aren’t a good mix of top players to pull in signed form, which includes current stars and former legends, but I would not go so far as to say the autograph checklist is loaded. Also, perhaps the biggest name in the product, Cristiano Ronaldo autographs seem to be few and far between. Two weeks since release and only one printing plates has surfaced among his signed cards on eBay. 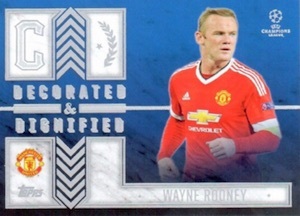 With popular global names like Ronaldo, Pirlo, Hazard, Beckenbauer, Bale, Iniesta, James, Suarez, Muller, Maldini and Rooney, among others, in the autograph checklist, value potential is certainly in play for 2015-16 Topps UEFA Champions League Showcase. But knowing that the two signed cards will likely be the only real value in the box that runs $80-100, collectors will be left to decide how much of a risk they are willing to take. At that price, the risk is not too severe but pulling a pair of $1-10 autographs is certainly a possibility. As a new niche offering for fans of global sport, I found 2015-16 Topps UEFA Champions League Showcase to be quite fun. Although I do consider myself fairly knowledgable about most aspects of the game, I will admit that I did not know several of the players I pulled, including one of the autographs. Therein lies the ultimate problem with a set like this as most fans follow a specific league or maybe a few of them but certainly not all the leagues in Europe. As long as you aren’t bothered by several names that are not as familiar, the product does offer something interesting and new for collectors. I’ m a card collector since I was a child. Now I’m 49 years old and never seen a collection like this!! I hope that it arrived to PORTUGAL very soon!!! So wait a second, 10 hits per hobby box? That can’t be right can it? Kenny � You are correct. The profile had the right info – 2 autographs per box – but the basic box breakdown was from another set. Thanks for letting me know. Is there a known reason as to why Lyon was left out of the set? I wish Topps would add a Johan Cruyff subset highlighting his achievements, which includes winning the European Cup three seasons in a row with Ajax, as a mark of respect to one of the world’s greatest footballers who passed away recently. Great Product. Great Design. Even when Im not convinced about the value of the parallels only because of the color. I found as a great idea that Topps include so many auto cards. At the end I don’t care if an auto is 1/1 or 1/100. Both are equally significant (even when logically a 1/1 is expensive than the others, I can’t agree that a Xavi auto is better on 1/1 than on 1/100. A Xavi auto is ALWAYS a Xavi auto. No matter the number on the corner.) Actually regarding the value I found a better decision pay 200 USD for an auto 1/100 than pay 2000 USD for an auto 1/1. And it is the same for the parallels without auto. There are no significant value on a base card than to his parallel 1/5 when only changed the back color and the number on the corner. At least when we talk about auto cards yo always receive an auto but with parallels with only pics I wasn’t so sure about the convenience of the investment. Finally a NOTE for your article: Your info about “Decorated and Dignified Autograph Set” is wrong. You write down that there are 6 cards on a Serial Numbered of #/25. The correct Serial Numbered for autos is #/5. The #/25 is for non-auto cards. PS. English is not my mother tongue so if you find any errors on the way I write please understand that I speak spanish and Im doing my best to write down properly. Regards, Alex. There are a couple things missing from this checklist. RTV also has parallels. (Presumably the same colors as all the other insert sets, although I have only pulled a red #/25 so far.) There’s also an un-stamped blue base parallel set that comes in hot packs.